We know you are a bottom line kind of person...so we'll just cut to the chase. You're going to love how much easier these return address labels make it for your to prepare outgoing mail. They've got a self-adhesive backing that lets you just stick them right on all your letters and packages. No more scribbling out your name and address! We're betting you'll also like the eye-catching design of arrows in four vivid colors. They'll let you add a touch of style to your mail along with all that efficiency. It's the perfect choice for a no-nonsense personality like you. Get your very own Monochrome Arrow Address Labels today! 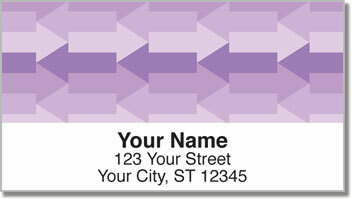 This design is also available to order as matching checks.